School children of a small village in remote north-east India, celebrated the Feast of St. Francis of Assisi in a novel way on Thursday, learning to love the animals and nature’s bounty that surround them. 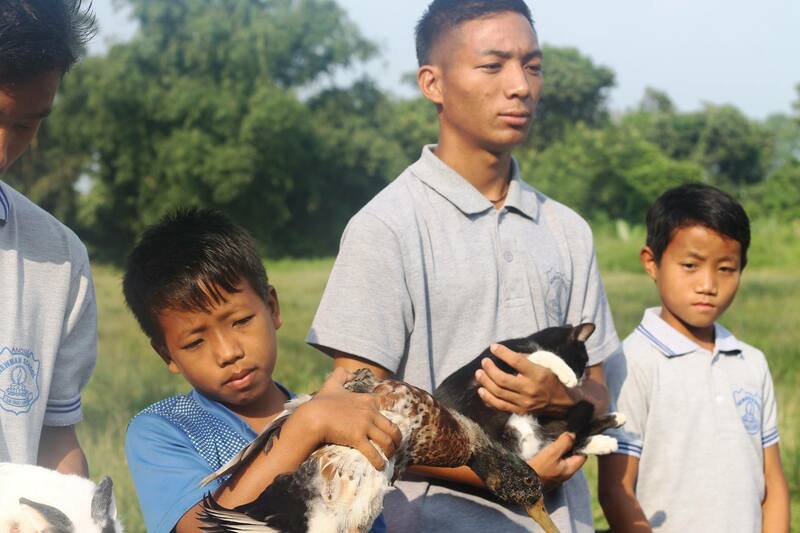 The students of Newman School Neotan in Changlang District of Arunachal Pradesh state were taught to treat animals and birds as brothers and sisters to mark the October 4th feast of the popular 13th century Italian saint regarded as the patron of animals and ecology. Fr. Felix Anthony, the Principal of the school celebrated an open-air Mass in a fitting praise of God amidst His creation. Those in-charge of the various livestock in the school campus brought rabbits, chicken, duck, goats, cat, pig and lovebirds to be blessed. The students were taught to treat the animals as siblings and to foster love for the environment like St. Francis. Known for his love for animals and creation, St. Francis composed the famous Canticle of the Creatures that proclaims God’s praise and thanks Him for some of the wonders of His creation which he believed deserve to be appreciated and valued. St. Francis thus referred to the sun, wind, air, and fire as his brothers, and to the moon, stars, earth, water, and death as his sisters. Speaking to the children on the occasion, Fr. Anthony explained that most of the natural calamities we see these days, including the recent flood in Kerala, is the result of our lack of love for the nature and all in it. “Indiscriminate deforestation, selfishness and greed over the natural resources has caused ecological imbalance, leading to either too much or too little rain and many other natural calamities”, he said. The feast of the patron saint of ecology, he said, is a wake-up call for all us to love, protect and promote the nature, animals and birds. “What you do with the natural resources today will shape the fate of your next generation”, he cautioned them. “It gives me a completely different perspective to call the rabbit ‘Brother Rabbit’,” remarked David Ngaimong who cares for rabbits. “As children of the same God who created everything, we are all brothers and sisters including the animals and birds”, he added. Greatly enamoured of St. Francis’ simplicity, poverty and love for God’s creation, Argentine Cardinal Jorge Bergoglio assumed the name Francis upon his election as the current Pope. Pope Francis who has made the environment a major concern of his pontificate, issued his encyclical, “‘Laudato Si’: On Care for Our Common Home” in June 2015, drawing inspiration from St. Francis. Newman School Neotan is one of the several schools of the Diocese of Miao in eastern Arunachal Pradesh, bordering Myanmar, China and Bhutan. The diocese was erected in 2005 and entrusted to the Salesians of Don Bosco. Its first bishop is George Pallipparampil.